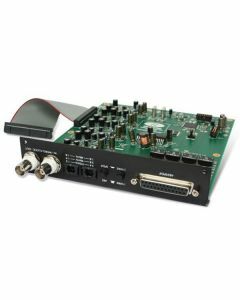 The ISA eight channel 192kHz A-D converter outperforms every other converter yet devised, and was the first audio A-D converter to utilise Burr-Brown Pro Audio Amplifiers and flagship PCM4220 A-D converter chips. With cutting-edge conversion technology seated within Focusrite custom analogue circuitry, the card delivers unparalleled performance; specifications include a dynamic range of 122dB and jitter less than 250 picoseconds. All eight converters are always available with this option, even when using the ISA428 and ISA428 MkII. When installed in one of these four-channel mic preamps, the the extra 4 converters of the A-D card are fed by four XLR inputs on the back labeled "ADC Input"